printermaintenanceltd has no other items for sale. It is not worth buying or using. Unfortunately, it is a sad story to tell because I have some regret buying it and investing on it at all. Fristly the paralle cable with 25 pin was meant for pc and not Laptop as my case is but I had to order for a 25 pin USB paralle cable on ebay. Haven´t had that, little did I know that its not compatible with my operati´ng system which is Window Vista. Neither the Software none the driver can I install, I was refered to HP website to seek for a possible solution but none instead I´m adviced by the company to buy both only then is a hope of using this Printer. Well I have given up hope on it and I am not prepared to invest on to that extend of buying the software or driver again from HP when as a matter of fact it is thier own product and I am a costomer patronizing them in a way of buying and using thier product. It is SAD. I have bought several of these excellent printers, and have been using them for some years now, so when the opportunity arises to buy another one, I do. 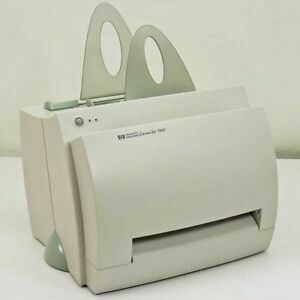 This is a simple basic black and white laser printer. Cheap to run and never seems to die. I takes A4 in portrait mode and envelopes in landscape up to DL. The paper is placed in the rear slot and sliding adjusters move to hold paper guides. Completed jobs arrive at the front housing or with the flick of a switch through he front lower slot. Not the fastest kid on the block but the most reliable I have ever had in 15 years of use. Cable wise it needs a special parallel cable (mini centronics) with a custom pin out which can easily be obtained. Standard cables don't work.Can be connected to the jet-direct print server. Extra memory can be inserted with the removal of a panel. Black and white print out is excellent although the driver sometimes moves to economy mode when it feels like it so the print can gray out. Toners cost around £7 or can be easily refilled. The only issues are speed and the wearing of rollers. Roller kits can be bought for around £10 and a little fiddly to fit but take no more than 30 minutes to do. Works with windows 98-8.1 but not Mac OSX 10.7 or later All in all probably the best product HP ever made. You can pick one up for as little as 99p. Simple to use, reliable and cheap to run. As my printer turns 12 this year I thought I'd write a review about it. The HP Laserjet 1100 is a handsome printer which blends effortlesly into any office. It has proven to be a very reliable printer and, although it recently developed the pulling-as-much-paper-in-at-once-as-it-can syndrome, once I replaced a few parts at very little cost it was as if nothing had happened. It never did let me down in any other way. It is very economical on toner, which itself is very cheap, and is quite a fast printer. It is a lot quieter than most laser printers and is very small (if only modern lasers were as small). The only downside I can think of is the cable it uses. Once my under-a-year-old-but-just-out-of-warranty Samsung all-in-one laser chose to conveniently die one day out of warranty I decided to put this HP back to use. I had lost the cable for it and noticed that it isn't a standard cable, it is a special HP cable and is actually getting quite hard to find, I ended up paying quite a bit for one. Overall a small, fast, quiet, reliable monochrome laser printer that can work forever if maintained properly. Far better models on the market now and I would avoid this one. This item was eventually delivered by Hermes and broken on arrival. I have donated it to the Heart Foundation and maybe they can use it. I have another hp1100 and do not actually like this model. I have always used the hp4050 which is far better, faster, better type printing and offering more scope to work with a PC. I had mine repaired by a Feltham company which did a botch repair so I shall have to suffer with the noise or buy another in the course of this year.